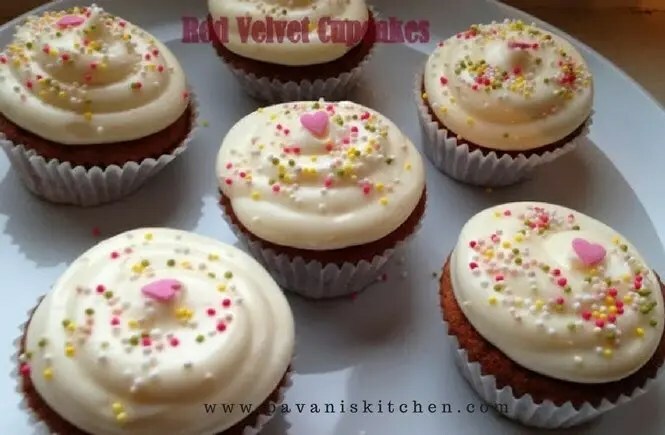 Today’s recipe is about yummy and delicious Red velvet cupcakes. These cupcakes came out very well and they are very fluffy inside. 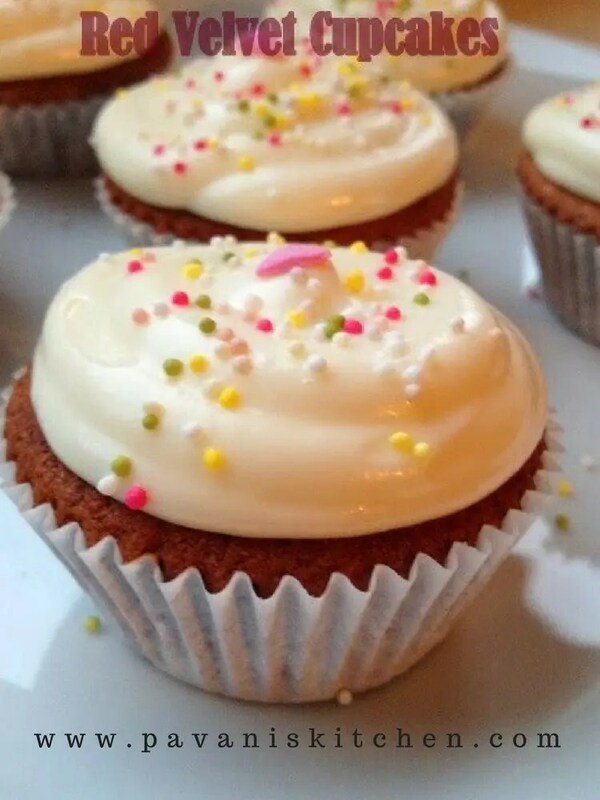 Here I used cream cheese frosting for these cupcakes. Here goes the recipe. 1.Preheat the oven to 175degrees. 2.Line the cupcake tray with liners and keep aside. 3.First, beat the butter and sugar until fluffy. (it took 5minutes for me) Add eggs slowly one by one and mix on low speed. 4.In a bowl, add cocoa powder, red colour and vanilla. Mix well and add it to the butter batter. 5.In another bowl, add salt and milk together. Keep it aside. 6.Slowly add flour and milk alternately to the butter mixture and mix well on low speed. 7.Add vinegar to the baking soda and mix well immediately. Add it to the mixture and mix on low speed for 2 minutes. 8.Bake for 18-20 minutes or until the skewer comes clean. 9.Transfer them on to wire rack and allow to cool completely before icing. Mix cream cheese and butter on high speed until it is smooth. Add vanilla extract and slowly add icing sugar. Mix well until all are mixed well. Here I used the star tip. Today's recipe is about yummy and delicious Red velvet cupcakes. These cupcakes came out very well and they are very fluffy inside. Here I used cream cheese frosting for these cupcakes. Here goes the recipe. Preheat the oven to 175degrees. Line the cupcake tray with liners and keep aside. First, beat the butter and sugar until fluffy. (it took 5minutes for me) Add eggs slowly one by one and mix on low speed. In a bowl, add cocoa powder, red colour and vanilla. Mix well and add it to the butter batter. In another bowl, add salt and milk together. Keep it aside. Slowly add flour and milk alternately to the butter mixture and mix well on low speed. Add vinegar to the baking soda and mix well immediately. Add it to the mixture and mix on low speed for 2 minutes. Bake for 18-20 minutes or until the skewer comes clean. Transfer them on to wire rack and allow to cool completely before icing. So colorful and lovely looking cupcakes. Wonderfully prepared. Very cute and attractive cupcakes, beatiful frosting too.